So apparently the number one skincare concern in the UK is dark circles, surprised? I was too. Obviously in an ideal world we would all have plenty of sleep, never drink any alcohol or caffeine and be blessed with the genes of a supermodel. Unfortunately, that's not the case so most of us need a little help from time to time. 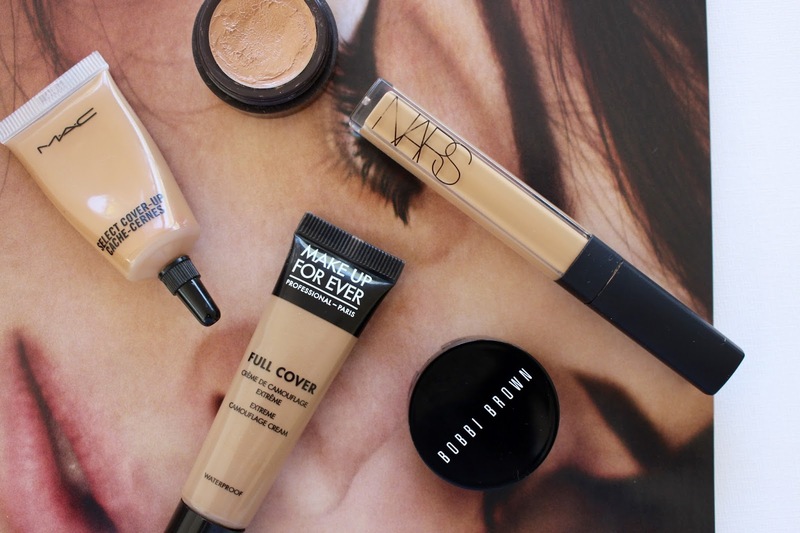 I've rounded up the best under-eye concealers on the market for every possible scenario. For when they don't look too bad but you're in a rush and need a little something under the eyes, MAC Select Cover-Up is a great option, it has light to medium coverage and blends really easily so it's really quick to apply. It comes in 13 shades to suit all skin tones apart from very dark black skin tones. For when you have dry skin under your eyes and everything you put on looks cakey and crusty, Laura Mercier Secret Concealer is creamy and moisturising but still gives you good medium to full coverage. Just remember to apply as little as you can get away with, the more the put on, the more likely it is to crease. That's the case with all concealers but particularly the very creamy ones. Comes in 12 shades, suitable for all skin tones. For when you need a good all-rounder Nars Radiant Creamy Concealer would be my pick. It's by far my favourite and most used concealer. A little dab works as a quick fix and blends out easily to a very natural finish but it can also be built up for completely flawless coverage. High coverage, very long lasting but still looks very natural on the skin, even when it's layered up. Comes in 10 shades to suit all skin tones. For when you need to look amazing in photographs it has to be Make up Forever Full Cover Extreme Camouflage Cream. This stuff is seriously high coverage, makeup artists even use it to cover tattoos. There is absolutely nothing you won't be able to cover with this and a tiny drop goes a long way. I reserve this one for evenings out and occasions when I know I'll be having my picture taken. It makes your under-eye area look completely flawless but does take a bit more effort blending wise. It's also worth knowing that it oxidises slightly on the skin, so if it's between a shade that's slightly too light and one thats just perfect go for the lighter one! Comes in 12 shades to suit all skin tones but some of the darker shades can only be found on larger counters. For when you have blue/purple tones mixed up in there you need a colour corrector which can be layered underneath your concealer to counteract the tones and allow you to use less concealer. Does your under-eye area often look ashy and grey after you've applied your concealer? If the answer is yes, try a corrector, if it's a no just skip this step. My favourite and unfortunately one of the few on the market that comes in a good shade range is the Bobbi Brown Corrector, it's creamy, blendable and pigmented, just don't put on too much because again, being creamy it will crease. Comes in 12 shades, suitable for all skin tones. MAC Select Cover-Up is £16/$19 from MAC Cosmetics, Laura Mercier Secret Concealer is £19.50 from Space NK or $25 from Sephora, Nars Radiant Creamy Concealer is £22.50 from Space NK or $29 from Sephora, Make up Forever Full Cover Extreme Camouflage Cream is £21 from Debenhams or $34 from Sephora, Bobbi Brown Corrector is £19.50 from Debenhams or $27 from Sephora.